Many Ethiopians are not familiar with the name John Robinson. a.k.a. “The Brown Condor”. The African-American aviator and activist who, almost single-handedly broke down the doors of segregation in the field of American Aviation in his early career and who is recognized today as the “Father of the Tuskegee Airmen” of World War II fame. 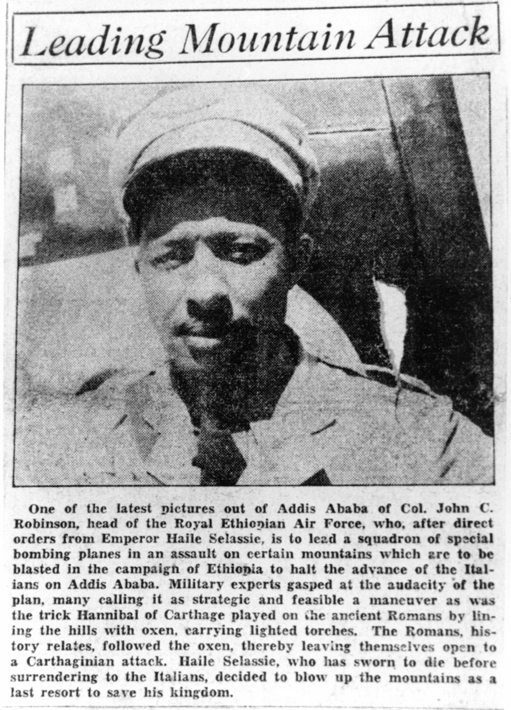 Col. Robinson also flew over 700 hours of dangerous missions for Ethiopia during the fascist invasion of Ethiopia in 1935 carrying men, equipment and supplies to and from the front lines of the battle all over Ethiopia. He also flew Emperor Haile Selassie on dangerous missions that boosted the morale and patriotic spirit of Ethiopia’s courageous patriots. Born in Carrabelle, Florida, but raised in Gulfport, Mississippi, Robinson was the first African American to be licensed in the United States. In the last few years the great legacy of his heroic deeds and amazing commitment to his beloved Ethiopia has come to be spoken of by thousands of Ethiopians and Americans who before knew nothing of this great work. he Reporter: As a Cultural Historian who has obviously committed a great deal of time and energy in resurrecting the legacy of Col. Robinson and the important relationship that he helped to establish between Ethiopia and the African American community can you tell us how this all began? 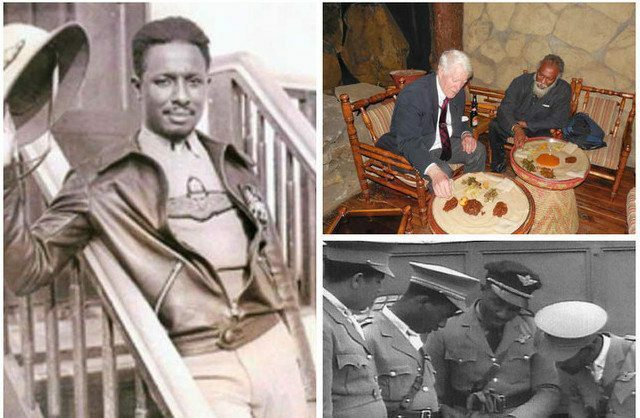 Yahoshuah Israel: Col. Robinson’s story is one of the most amazing chapters in Pan African history which had its inception here in Ethiopia. Its importance cannot fully be appreciated without realizing the politics that existed in the world during the time of Col. Robinson and Emperor Haile Selassie and the fascist invasion of Ethiopia under Mussolini. During this time all of Africa was suffering under the oppressive weight of European colonialism. But this was also the time when Africa’s young freedom fighters, Nelson Mandela, Jomo Kenyatta, Sekou Toure, Kwame Kwame Nkrumah and many others were beginning to organize their respective movements in their home countries. In the middle of this great tumultuous time Ethiopia was shinning like a brilliant glorious sun on the mountain top to not only its African brother nations but also to countries like Cuba, China and other countries in South America. The great victory at the battle of Adwa by Emperor Menelik had resonated throughout the entire world that white dominance was not to be the undisputed order of the day. Ethiopia literally became the inspiration of all the oppressed peoples of the world as she hurled a spear into the heart of the concept of “white supremacy”. Against this backdrop a conspiracy was contrived by the European countries with the tacit approval of America that Ethiopia must be defeated and reduced to a colonized nation – just as all the other African nations were – in order to stop the other nations from following her example of freedom. This is the stage on which Col. Robinson stepped on May 29, 1935 when he arrived in Addis Ababa to begin the training of Ethiopian pilots for the coming war. 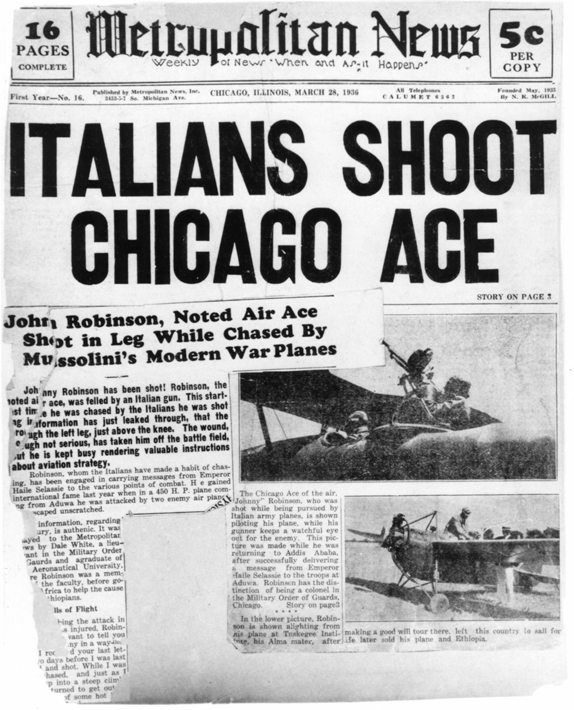 The League of Nations having already secretly sold Ethiopia out and the American government at that time went along with the plan by not providing Col. Robinson the military fighter planes that he needed to effectively defend Ethiopia from the skies against the Italian war planes. Even though during this same time America was not only supporting China against Japan’s attempt to colonize China but actually created a group called the American Volunteers that are famous for flying missions defending China; they were called the “Flying Tigers”. My book, The Lion and the Condor. 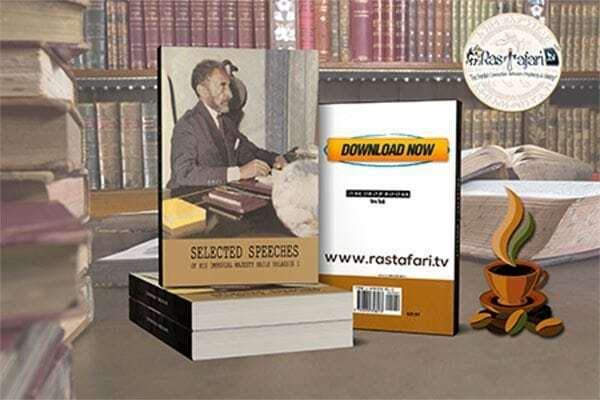 provides an accurate picture of the obstacles that Col. Robinson, Emperor Haile Selassie, the Hakim Worqeneh Esheté (Known as Dr. Martin to the western world), Malaku Beyen and the fearless patriots confronted in the war. All of these things had been forgotten and covered up or so distorted that they did not truly reflect what actually occurred during this tremendous period in Ethiopian history. It is because of the efforts of several others and myself that the awesome resurrection of Ethiopia’s and America’s great hero Col. Robinson is echoing across two continents today. The main characters who deserve mentioning are former president Girma Woldegiorgis and Lij Daniel Jote Mesfin, president of the Ethiopian Patriots Association. Without a doubt, had it not been for their embracing the need to remember the great sacrifice and service of Col. Robinson we would not be having this conversation today. Although, Thomas Simmons, author of the first book on Robinson, came here a few years ago with Yaw Davis, and the US Embassy dedicated reading garden to his memory very little momentum had developed after these events. It was not until the historical commemoration last year during the 74th Victory Day celebration organized by the International Council for the Commemoration of Col. Robinson(forerunner to the Col. John C. Robinson Global Initiative) in partnership with the Association of Ethiopian Patriots, and President Girma that a tidal wave of progress has been made to truly resurrect the important history that had been forgotten for over 80 years. What gave rise to my research was an incident that I encountered with a person here in Ethiopia. This individual let me know – in no uncertain terms – that the history that had been written about Col. Robinson was not accurate. It was at that time that I resolved in my mind to discover the truth of Col. Robinson’s life particularly his life here in Ethiopia which is where his legend truly begins. The first thing I discovered was that neither of the authors of the two previous books written of him felt it important enough to come to this great country and investigate the myths and stories that were told of him here. As a result much of what they wrote about Col. Robinson I found to be inaccurate when I spoke with those who actually knew him and remembered significant episodes in his life here in Ethiopia including people like Prof. Abiy Ford, and President Girma and recently deceased, Gabriel Tedros. Through the most remarkable coincidences I was even able to locate the stepson of Col. Robinson who is 87 years old and lives in Holeta. He provided a wealth of unknown history of Col. Robinson’s personal life. 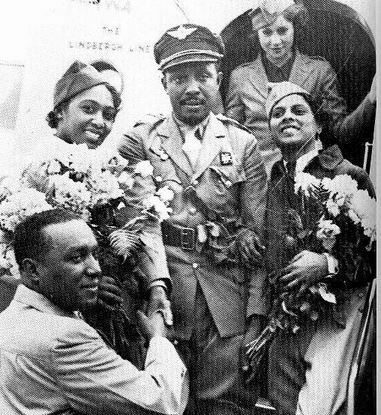 My book documents and resurrects not only the personal life of Col. Robinson but also such important characters of Ethiopian-African American history as Malaku Beyen, Hakim Worqeneh Eshete, Innis Minion Ford, and also heroes of he Imperial Ethiopian Air Force which Col. Robinson established. People like Col. Semret Mehdane, who was a courageous young cadet and becomes the first Ethiopian CEO of Ethiopian Airlines. As a cadet he was instrumental in saving the lives of many of his fellow cadets at the threat of facing court marshaling from Baron von Rosen who eventually is relived from his position; Major General Asefe Ayene, and may others whose deeds are so inspiring but were lost to history. It seems that the hand of destiny had decided that these wonderful efforts of men and women connected to that time could help inspire us in the development of a great Ethiopia today and so the Almighty had resurrected their amazing legacies. My book contains the contributions of many key individuals that make it a classic in historical research. As I have already mentioned certain key people there are others such as Ambassador Rudolph Agstner of the Austrian Embassy who provided a wealth of information on a woman known as Madame Eisner who was the romantic partner of Col. Robinson for over 15 years and whom he was living with at the time of his death. She was famous here in Ethiopia and was a special cook to Emperor Haile Selassie. She loved Col. Robinson so much and was so heartbroken when he died that every Friday after his death (he died on Friday) she would light a candle in her bedroom and pray and cry for Col. Robinson. She did this for the remainder of her life. Another remarkable story in the recounting of this astonishing history is that of Mario Capussi, an Italian immigrant that came here during the occupation. Mario Capussi loved Col. Robinson and felt that he was a great man. When Col. Robinson died Mario was so saddened that he started a tradition of putting flowers on his grave. This became a family tradition that his son and daughters maintained after Mario’s death in 2010. It was only due to the remarkable love and admiration of this Italian family for Col. Robinson that we were able to rediscover the long lost grave of Col. Robinson after more than 60 years. This is only a glimpse of the important information contained in the new book, “The Lion and the Condor”. Thank you for asking this very important question. It is critically important in providing an answer to young and old Ethiopians on why and how Ethiopia, which was the head of all African nations and had inspired the entire world before the war, became the least of all African nations. To answer this question I must give great credit to a little known paper written by Richard Pankhurst it is called, Post World War II Ethiopian British Military Policy and Action for the Dismantling and Acquisition of Italian Factories and Other Assets, 1941-42. This paper details how during the five year occupation Italy had invested an enormous amount of infrastructure all over Ethiopia. Italy had industrialized Ethiopia to an extent that shocked the British military when they finally escorted Emperor Haile Selassie to re-enter Addis Ababa on May 5, 1941. There were hospitals, airports and modern factories in all the major cities of Ethiopia built by the Italian immigrants that numbered over one million who had flooded into Ethiopia. Modern state-of-the-art factories and car manufacturing plants that produce everything from pure oxygen for the hospitals to a huge dry dock that conveyed supplies and equipment. Over 16 pages of modern industrialization assets that was now rightfully the possession of Ethiopia. When the British Military saw this they were shocked; they realized that if this development was left to Ethiopia, Ethiopia would immediately become one of the most developed nations on the continent of Africa. This would definitely doom and bring about the demise of colonialism which they were determined to not allow. The military began immediately to dismantle all the factories and structures that had been built by the Italians and they were shipped to their other colonies; Uganda, Kenya, South Africa, India, Egypt, etc. In fact the various colonies began to fight over the assets. Those that they could not dismantle they destroyed. At one point a stand-off occurred in Jimma where the Emperor is said to have stood in front of a British army refusing to allow the dismantling of a rope factory. Britain, who has been called the “liberator” of Ethiopia, was in fact the crippler of Ethiopia. It can be argued that this incident should not be pointed to as leading to Ethiopia’s historical position of being poor and backwards and that’s true there were other things that contributed to this. But it cannot be disputed that this massive dismantling of assets that rightfully should have remained in Ethiopia was the first of a chain of events that led to crippling of Ethiopia. The awareness of this that occurred some 60 years ago makes it all the more amazing of what’s happening today in this great country. Ethiopia is one of the fasting growing economies in the world and is taking its long-awaited position among the leading developing countries. I ask the question in my book, “What if the growth that we see today had been allowed to begin 50 years ago? Where might Ethiopia be positioned on the world stage of nations and narratives had Emperor Haile Selassie been able to keep those assets; and had Col. Robinson been supported properly by the American government in connection with Ethiopia’s defense? Of course there are those who will say, “we cannot really know what might have resulted had these things not occurred”. But I say clearly and without any doubt that had Ethiopia not been crippled by deception and intrigues and detrimental governmental policies by key players in the world at that time history would be much different today. The mission of the CJCRGI is to continue the legacy of Col. John C. Robinson in building a progressive and mutually rewarding relationship between the African American community and the world diaspora and Ethiopia and all of Africa. We see Ethiopia as the de facto heart of Africa and Addis Ababa as the de facto capital and we are dedicated to turning the attention of black Americans to their mother country so that they can actively help in Ethiopia’s development. During Col. Robinson’s time the hearts of African Americans was with Ethiopia and all of Africa but we had very little economic power. Today Black Americans have a buying power of over 1.3 trillion dollars annually. If we were a nation we would be ranked number 16 in economic strength among the world. We impact significantly every industry in the world including medicine, science and technology, entertainment and sports. Our vision is to make our brothers and sisters in America realize that our motherland is the richest continent on earth yet we have fallen far behind in participating in its development. They need to know that not only does Africa need them but that they, even more so, need Africa. Our mission is to make them see that their future is rooted in our motherland. We are a people with a history and lineage that goes back to and beyond the biblical times of Queen Makeda and King Solomon. Most importantly they need to know that in our unity we are prophesied to be the architects of a new world built on justice and equality for all people. Something that others have spoke of doing but whose actions have nearly destroyed our earth. Ethiopia and all of Africa must visualize themselves as saviors of the world. Because we have been mentally broken by the institutions of racial oppression we don’t think of ourselves as being able to effect powerful change in the world. Little white kids in Europe and America grow up thinking that they can save the world. This is projected in their movies and literature. There is always some super hero saving the world from destruction. We have to realize that we are the real super heroes. Ethiopia has a legacy of diverse religions and ideologies living together in harmony that no other nation can boast of. The culture of Ethiopia is such that you can find the roots of true humanity and civilization spreading from Abay (the Blue Nile) radiating outwards to all of the world. Yet Ethiopians are the most humble of the God’s people. I often say to myself that Ethiopia needs to develop a bit of an ego and step up on the world platform of leadership because the world has much to learn from her. I have just completed another book that tells the forgotten story of Ametsegna Washa (The Cave of Rebellion). It is about a war crime committed by the fascist Italians in 1939 that killed in some accounts from 2,000 to 5,000 mostly villagers and 900 patriots with illegal mustard gas. The story of what happened is so compelling that it must be told so that the world is aware of the atrocities that were committed in Ethiopia during Col. Robinson’s time. The world is familiar with the tragedies that occurred in Nazi Germany, and in China and other war torn countries but many of the things that occurred here have been covered over and treated like they are not important. I was asked by Lij Daniel Jote Mesfin to participate in an historical expedition to Ametsegna Washa (the Cave of Rebellion as the Italians named it). It is about 350 kilometers from Addis in the Amhara Regional State. In the cave are the remains (skulls and skeletons) of the people who were killed in the most horrible way. I was the first American to witness this terrible tragedy and I am compelled to give voice to those courageous patriots and villagers who lost their lives and have been forgotten. This powerful picture book was commissioned by Lij Daniel Jote Mesfin and will be featured as part of the 75th jubilee anniversary of The Ethiopian Patriots Association’s celebration of Victory Day on May 5th. All proceeds will go to the Patriots Association. I have also signed agreements with Hierarchy Motion Pictures of Beverly Hills in California to produce a full length movie of Col. Robinson based on my book, “The Lion and the Condor.” The movie will portray Emperor Haile Selessie, Hakim Worqeneh Esthete, and many other key Ethiopian heroes that the world needs to know of. The CEO told me that he wants Will Smith to play the title role of Col. Robinson. The plans for the movie are great but equally as exciting is the fact that Teddy Afro told me that “we must not forget him (Col. Robinson) I will write a song paying tribute to him in an upcoming album”! 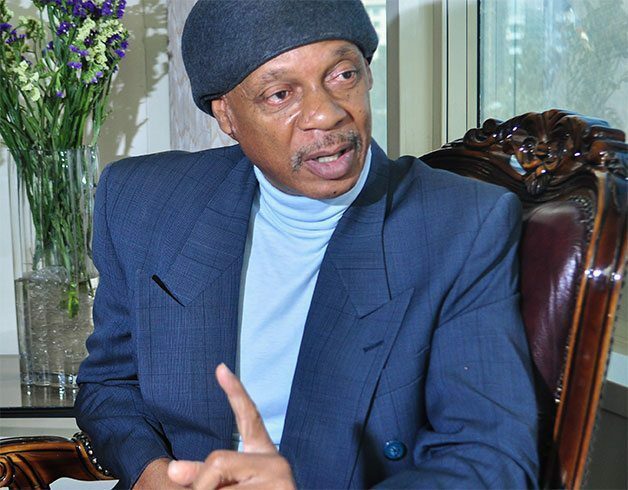 I consider Teddy Afro the Michael Jackson of Ethiopia if he makes a song about Col. Robinson, Ethiopians all over the world will know of him and his love for Ethiopia.